I wanted to thank BASE3 for the completion of the Keeton Corrections job. The professionalism that was exhibited was outstanding. You were able to hit the deadline without sacrificing any quality. I would not hesitate to use BASE 3 again for any of my jobs and would highly recommend them to anyone else. One team. One mission. 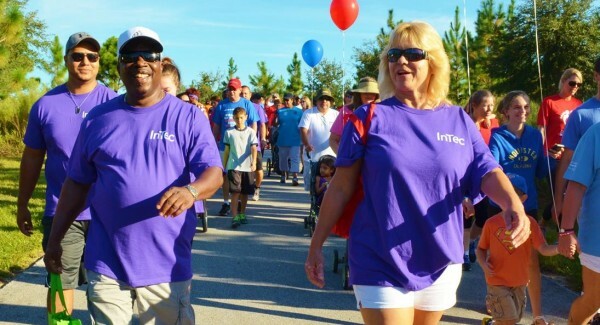 One community…read the purple t-shirts worn by the Base3 Facility Automation walkers during the Marion County American Heart Association Heart Walk. Their goal? To generate donations to be used for cardiac research and education initiatives, eventually wiping out heart-related ailments. Employees representing Base3 Facility Automation were all first-time walkers. A sign placed along the 3-mile route by event officials recognized Base3 as a “Super Team” because they raised over $3,800 and were among the top teams. This year was the largest Heart Walk event in Marion County history. A total 4500 individuals from 66 companies and organizations joined forces to walk the designated three miles of trails in support of heart health. Heart Walk is part of a nationwide campaign undertaken by the American Heart Association (AHA) to improve heart health through education and physical activity. Their research indicates that less than one percent of the current US population meets the criteria for ideal cardiovascular health. Studies further reveal that heart disease is the number one killer of all Americans, surpassing all forms of cancer combined.